- View, Print, Email, FAX (driver required), eforms (visual electronic forms) created with EZ-Forms PRO Designer. - Encryption enabled. (pw reqd.) - View web enabled eforms. 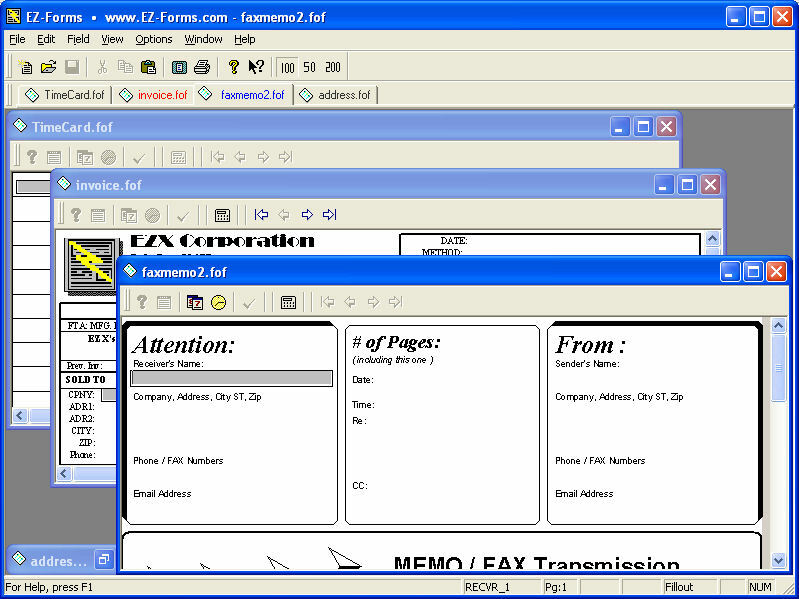 EZ-Forms Filler for eforms (visual electronic forms) Fillout, Save, Modify, Print, Email, FAX(driver required), DataBase, etc. eforms created with EZ-Forms PRO Designers. Encryption enabled. Network and internet compliant. Belltech Business Card Designer Pro helps you design and print your own business cards with logo from professional quality business card templates in minutes. This business card maker software supports all Avery papers, has great design tools. eXPert PDF 4 provides everything you need when handling PDF documents, such as Creating, Assembling, Marking up/Commenting, Editing, Securing, Archiving, Publishing/E-mailing, Searching and indexing. Now you can create your own beautiful and professional CD and DVD Jewel Cases and Labels in just minutes! Perfect for business, home, or hobby. Works with any type of paper or CD label, DVD Label, or Jewel Case! Now freeware. Miraplacid Form will help you to scan and fill paper form. You can type text exactly where you need it. You can merge a form with data exported from database or spreadsheet and print it all. You can save data you entered or changed. Export to PDF. Science helper for MS WordÂ® is a fundamental tool for the aspiring science teacher, student or researcher. This program will allow the user to make a professional and functional document with ease of point and click usage. A features-rich application for creating drawing, form, document, and form-based applications. The package contains a runtime program for document presentation, data entry and database management. Unicode native and support PDF import/export. Share Outlook folders without server. Microsoft Outlook add-in for synchronizing and sharing Outlook folders, sharing PST, sharing email, sharing calendar without Exchange. Share calendar, share Outlook contacts, sync Outlook contacts, address book. Sync Outlook contacts without server. Microsoft Outlook add-in for synchronizing and sharing Outlook contacts, address book, distribution lists. Share contacts folder in a few clicks, synchronize Outlook contacts automatically. Excel Server integrates MS Excel and MS SQL Server into a network-based Enterprise Information Platform, on which business processes can be implemented and deployed easily in a business-oriented and "DIY" manner. It is also an EAI product. OLFolderSync can sync any Microsoft Outlook folder with anyone else's by eMail messages. Synchronization of these folders runs as a background process facilitated by OLFolderSync synchronize messages. This site does not contain serial number, crack, keygen EZ-Forms PRO Viewer serial number : serial number is the simplest type of crack. A serial number(cdkey,product key,etc) is register the program as you may already know. a crack or keygen may contain harmful software. If you cannot find the exact version you want, just give it a try. for more information read .nfo/.txt/.diz file include in zipped file.